Time to talk FY16 budgets. Yep, FY15 just began on October 1, 2014, but good budget planning begins years ahead, right? One of the political footballs that gets tossed around every year is what’s known as the Rolling Reserve Cap. State education officials are always eager to know the amount of the Cap so they can look at how much “new money” is available in the Education Trust Fund (ETF) budget. 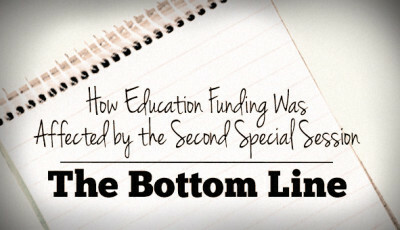 The Education Trust Fund Rolling Reserve Act, a.k.a., the Rolling Reserve Act, was passed during the 2011 legislative session. It was hailed as a way for legislators to budget more conservatively by placing a “cap” on the amount of money that could be allocated in a given budget year, moving monies above the cap into rainy-day-type accounts, ultimately avoiding proration. The first time the cap was used was in FY13. The cap is calculated in part by looking at average growth over a 15-year period. Presumably, the long time span of 15 years allows for wide year-to-year swings in revenue to be absorbed more easily. In years past, the Executive Budget Office and the Legislative Fiscal Office (LFO) would each forecast revenue for the coming fiscal year. A midpoint between the two forecasts was used as the amount that could be allocated from the ETF budget. In addition to these two forecasts, the cap is on the table. 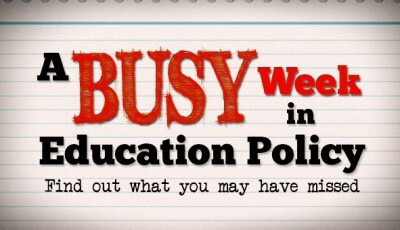 Avoiding proration is a necessity for Alabama’s boards of education. Just the mention of the word causes a visceral reaction in veteran Chief School Finance Officers. 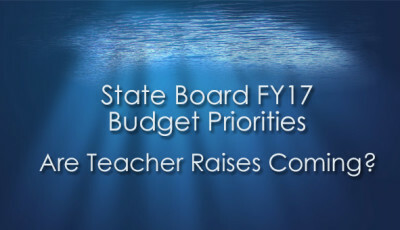 Remember, the ETF budget is typically passed at the end of a legislative session, around the time that school boards are contracting with teachers and other personnel for the following school year. If legislators take a rosy view of the budget, school boards may choose to hire more folks, or maybe just not let anybody go in anticipation of that rosy budget. When reality hits (usually the following December or January, though sometimes it’s later) and proration is declared, there is no way for school boards to avoid taking a huge hit, because salaries cannot be prorated. School boards must use local money to pay the shortfall in what the state provides for salaries of state personnel. Three straight years of proration in FY09, FY10, and FY11 put school boards is precarious positions, with many having to borrow money from local banks just to make payroll. 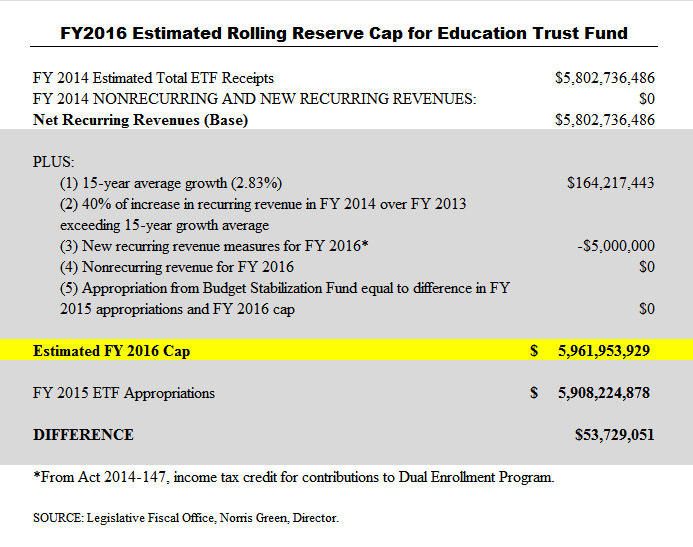 So here’s the first estimate of the FY16 cap, released by the LFO. Note the instructions for how to calculate the cap. What this tells us is that the LFO is expecting there to be $53.7 million in “new money” available in the ETF budget for FY16. LFO Director Norris Green told me on Friday that another $35 million could be made available for FY16 if the Rainy Day fund ends up being totally repaid from the FY15 budget (which it should be, based on the requirement to pay it all back by June 2015, which is within FY15). 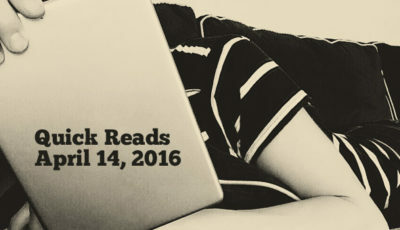 The author of this article does a good job explaining that conundrum. If that holds, then the total amount of new money available for FY16 could be as high as $88 million. But again, this is just the first estimate. If you’re interested, here’s the FY14 cap calculation, and here’s the FY15 cap calculation. What If the Time Span for the Cap Calculation Was Shorter? Many folks in education have claimed that using a 15-year time span is too long, and because of the prolonged period of lower revenue between FY08 and FY12, any improvement or increase in revenue will take too long to realize. In other words, the 15-year time period doesn’t allow us to take advantage of the recovery quickly. But that was kind of the point of the Rolling Reserve Act, wasn’t it? To keep folks from spending it all in times of good fortune, and to put some money away for the rainy day that always comes? State Board of Education member Mary Scott Hunter (R-Huntsville) asked questions at the October state board work session regarding how many times would the ETF budget would have had to have been prorated in recent history with different time spans. That certainly piqued my interest. In order to figure that out, you have to have a few key numbers, including the amount of recurring revenue for each fiscal year. LFO Director Norris Green shared this information with the Alabama School Connection, allowing me to do some basic calculations with the what-ifs that Hunter suggested. Would Proration Be Avoided Using a Shorter Time Span? All methods resulted in proration being needed for FY08, FY09, and FY10. Proration would have been needed for FY11 when using the 15-, 10-, and 5-year averages. Proration would have been needed for FY14 when using the 15-, 10-, and 3-year averages. So, the number of times we would have seen proration is almost identical, which conflicts with remarks from supporters of the cap, who often state that proration could have been completely avoided with the use of the cap. Notice that IF the FY14 cap had been utilized, proration would have been needed using three of the four time spans. How did that happen, you ask? In early 2013, LFO Director Norris Green cautioned that the FY14 cap was higher than revenue estimates. 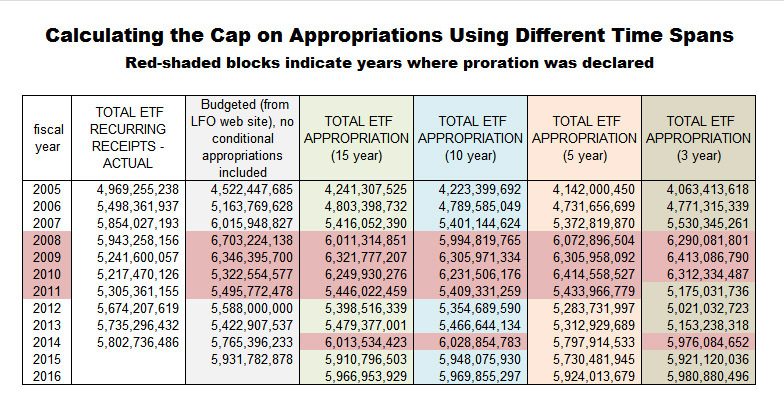 As a result, the legislature appropriated $230 million less than the FY14 cap for the FY14 ETF budget. That was the right thing to do to avoid proration. But in FY15, the legislature exceeded the cap by $23.6 million, leaving some to wonder what good the cap is if it can be exceeded. Back to the shorter time span question: The only place I can see where it might have saved us is in FY08. The legislature overspent by about $800 million for FY08. Using either a 15- or 10-year rolling reserve cap would have resulted in only a $51 or $68 million overshot respectively, which would have bought time to see the recession coming. That might have saved us from emptying out the Rainy Day funds, which we are now working to repay. Hindsight is 20/20, though, and there is really no way to know for sure, particularly given that the legislature can simply override the cap by passing the ETF appropriations bill. The chart below depicts the amounts of the cap calculated four different ways, using a 15-year, 10-year, 5-year, and 3-year average. All other rules around calculating the cap stayed the same. Red-shaded blocks indicate when proration was/would have been declared. Final chart. 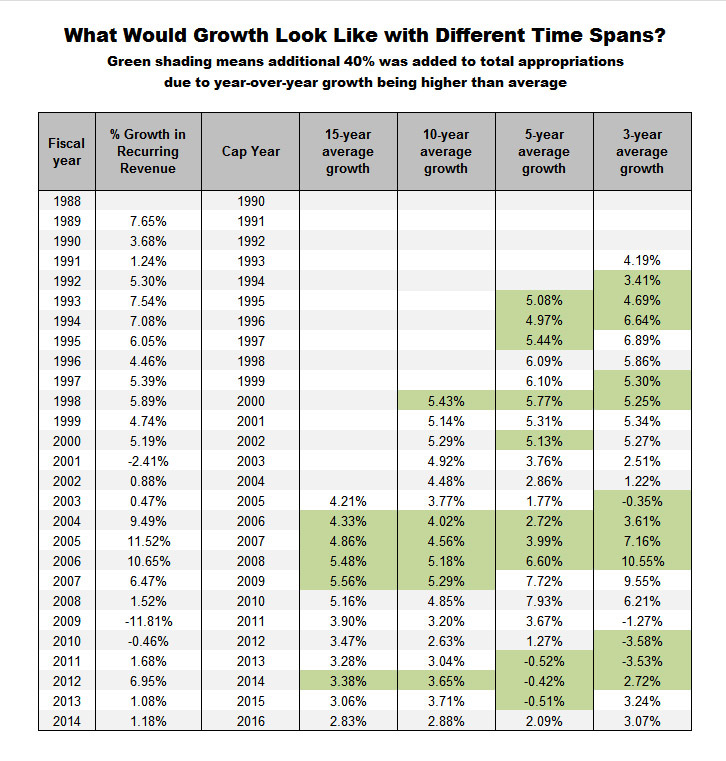 Here’s what the percentage growth looks like using the same time spans. The green shading indicates an additional 40% of growth in recurring revenues would be added to that year’s ETF appropriation because the year-over-year growth in recurring revenues (2 years prior over 1 year prior) was higher than the calculated average. That mechanism allows the state to take advantage of increased revenues. So, now you tell me. What do you think of the cap? Does it need to be adjusted? Does the time span to calculate growth matter? Would any of these time spans have been able to better protect us from the recent recession? 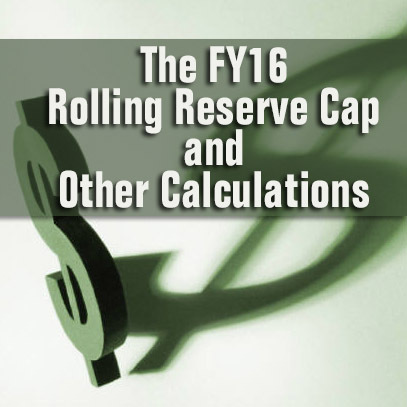 The Rolling Reserve Cap calculation is clear in the first chart above depicting the FY16 estimated cap. In the second chart, growth had to be re-averaged based on the time period (10, five or three years), which is depicted in the third chart. Step 1 is to utilize the LFO’s numbers for recurring revenue. Step 2: calculate the 40% figure (when year-over-year growth exceeded the average growth for that time period), if applicable. Step 5 was omitted because this methodology isn’t applicable to years prior to FY13. The ETF Budget Stabilization Fund was created as a part of the Rolling Reserve Act. After the Rainy Day Account is repaid, any revenue in excess of the cap will be transferred into the Budget Stabilization Fund. Transfers will then be made out of that fund to avoid proration in future years. At this time, that fund has a zero balance. When you add those figures together, you get the “Total ETF Appropriation” for that time period.